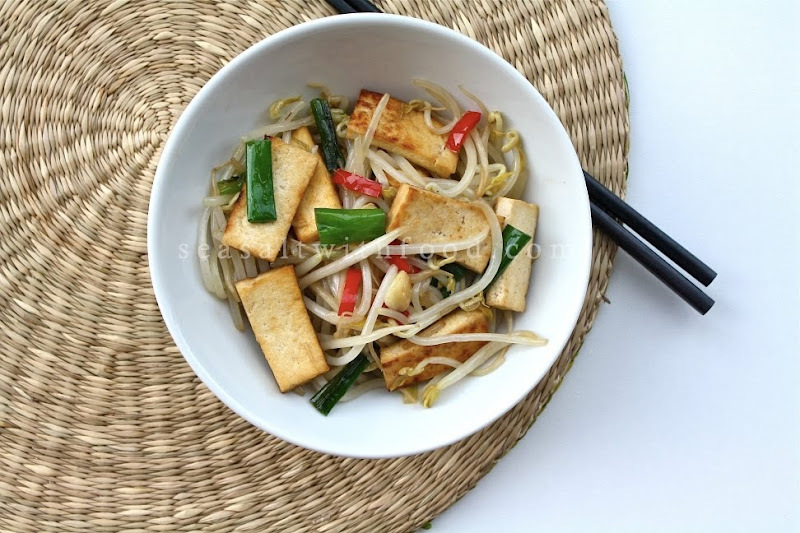 Heat the oil in a wok and pan-fry the bean curd on moderate heat until light golden in color. Remove and set aside. Fry the salted fish until crispy. Toss in the garlic and chilies and stir-fry briefly until fragrant. Then add scallions (white part) and a quick stir-fry. Toss in bean sprouts, fried bean curd, oyster sauce, and sea salt. Stir-fry for about 40 to 50 seconds and add the remainder scallions. Stir for another 20 to 30 seconds. (add some water, if it's too dry). Serve immediately. Wow this dish looks a lot like a dish on the Rasa Malaysia blog. Did you copy it? If you are so inspired by the dishes over there please link to the site and give credit please. It is the right thing to do. @Chris: Wow! Are you accusing me of plagiarizing Rasa Malaysia's work ? I do not appreciate it at all, what 'copying' have I done ? This is my old recipe which I have posted last year. Btw, this is a typical everyday homemade dish in my house. Nothing special at all. if you have anymore problems feel free to comment. I think an apology is appropriate in this situation as falsely accusing me of plagiarism just reeks of rudeness. Chris, you should know this recipe is very common in South-East Asian countries (Indonesia, Malaysia and Singapore) I have had this food since I was a kid. People should always do their homework before accusing - it's so distasteful. Bean sprouts is the most common ingredient in any Chinese-Asian home, it'll be a shame if you didn't know in first place, just shows how shallow a human can be - this is to you: Chris. Shame! I don't think anybody should claim this dish as their own 'creation' -- just as dumb as claiming that Rendang is your dish. Is this Chris person even real? no blog link or email? 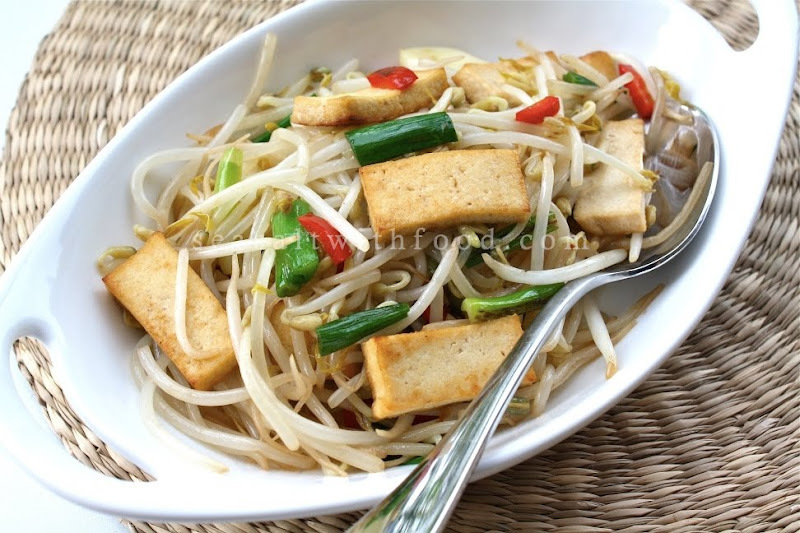 Maybe can get this whoever Rasa Malaysia patent this stir-fry bean sprouts dish or file a law suit over this common dish that all SE Asians know! Who she thinks she is? The legend of SE Asian food?! My a88. Hey, you made the top 9 today. Congrats! Don't bother yourself about ignorant idiots who have not been exposed to the world and have been cocooned in their tiny little brain-world and think they have the right to tell people off. I think your site is super! Wow, some people just have the nerves. This dish is so comman in Malaysian household. You mean RM invented this dish?? I have eaten and cooked this dish many times and if I want to post this on my blog, do I have to get Rasa Malaysia's permission? @ Chris: Your real name? No link and a plain common name.Rest known you could be Bee of Rasa Malaysia herself! Just my guess, don't have to get upset. I'm not accusing. Inspired: Don't flatter yourself too much you *****! Credit: Go to foodgawker/tastespotting and search for beansprouts, if they all look the same, all of them need to credit Rasa Malaysia as well is it??? It is the right thing to do: NO, it is not the right thing to simply credit back when you did not plagiarize! So get back here and apologize else don't ever come back!